I have one word that should describe gold investors now. At least, those investors who want to make money. Be bold! Dare to go where others fear to tread. It raises your risks. But it also greatly raises your odds of making money. Remember that motto. And at the end of this article, I’ll give you three ways to play this market like Patton. Well, as it turned out, I called the bottom in gold. Now, sure. That call could have gone against me. But I was right. And how about the picks I gave in that article? Here’s what happened with both gold and my first pick, the VanEck Gold Miners ETF (NYSE: GDX). You can see that gold is up about 9% since I called the bottom. GDX, meanwhile, is up about 18%. That’s due to leverage. As gold goes higher, the profit margins of gold miners widen like the Grand Canyon. And if you see that circle on the right of the chart, that’s a “Golden Cross.” That’s a very reliable technical signal for gold. It’s saying prices should go higher yet. Potentially much higher. Anyway, GDX is just one pick from the article. What about the other two? Buddy, if you didn’t buy ‘em, you don’t want to know. But sure. The first is AngloGold Ashanti (NYSE: AU). Since that article came out, it’s up 92%! My Supercycle Investor subscribers have traded in and out of AngloGold a couple of times, banking profits along the way. They own it again, because AngoGold is a great vehicle to ride a gold rally. The other pick was Newmont (NYSE: NEM). It’s on the Devil’s own rollercoaster due to its recent acquisition of Goldcorp (NYSE: GG). Many in the market think Newmont is biting off more than it can chew. And it’s not one of my Supercycle Investor recommendations. Still, indigestion and all, Newmont is up 8%. Now, if you didn’t listen to me on August 21, that’s okay. I’ve talked about gold 17 times between August 21 and now. Surely, you listened one of those times. And in those articles, I’ve recommended GDX a half-dozen times. Surely, you bought GDX one of those times. Well, if you didn’t listen – if you never bought GDX or any ETF or gold miner or gold itself – don’t worry. Gold is breaking out. Higher prices are ahead. Your best opportunity may still be ahead of you. You probably know in your gut that the yellow metal is on its way to $1,400. We’ll find out if that’s a destination … or just a signpost on the road to higher prices. GDX, meanwhile, is poised for even bigger gains. Thanks to that leverage I talked about. Now here’s even better news. Nothing travels in a straight line; Not in the markets anyway. 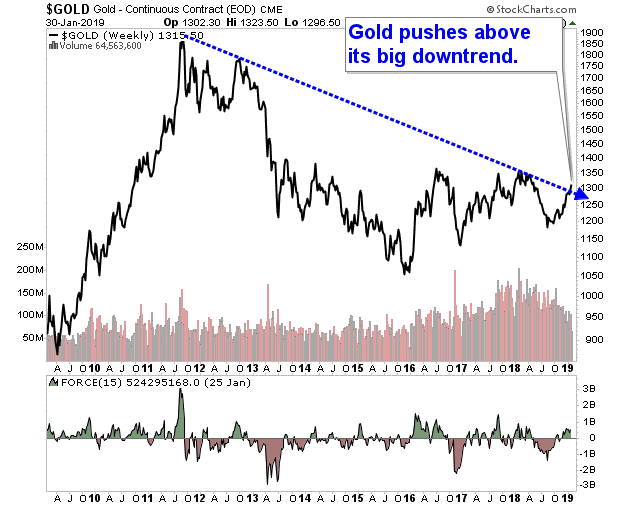 There will be pullbacks along gold’s road to higher prices. Miners will likely pull back even more. A wise investor will see those pullbacks for the opportunities they are. Like General Patton said, “Audens, Audens, Semper Audens.” The future – and your potential fortune – is calling. It’s up to you to seize the moment. 1 agree with you 100%. I am long so far.